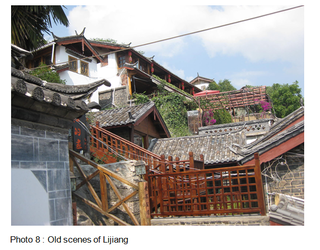 Lijiang City (simplified Chinese: 丽江; traditional Chinese: 麗江) is a prefecture-level city in the northwest of Yunnan province, People's Republic of China. It has an area of 21,219 square kilometres and a population of 1,244,769 as of 2010 census. 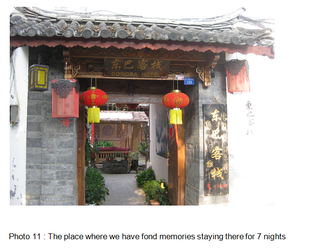 The town has a history going back more than 800 years and was once a confluence for trade along the old tea horse road. 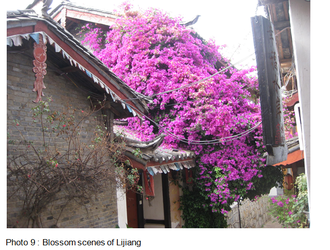 The Lijiang old town is famous for its orderly system of waterways and bridges. The old town of Lijiang differs from other ancient Chinese cities in architecture, history and the unique culture. The town was ruled by the Mu Family during the portions of the Ming and Qing Dynasties, a period of nearly 500 years. Overlooking Lijiang Old Town is Lion Hill and at its summit is the Wangu Pavilion, which is a wooden building that stands 33 m tall and boasts 10,000 dragon carvings. The pavilion is constructed on 16 columns each of 22 m in height. The pavilion is a masterpiece of Qing Dynasty architecture that has been extensively restored following the designation of Lijiang Old Town as a UNESCO Heritage Site. 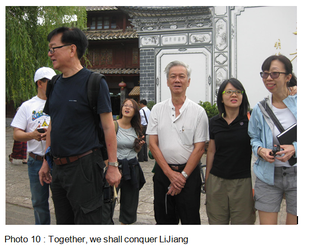 Li Jiang trip is a trip which Teacher, Mr Lim Kang Kee has always wanted his students to experience. 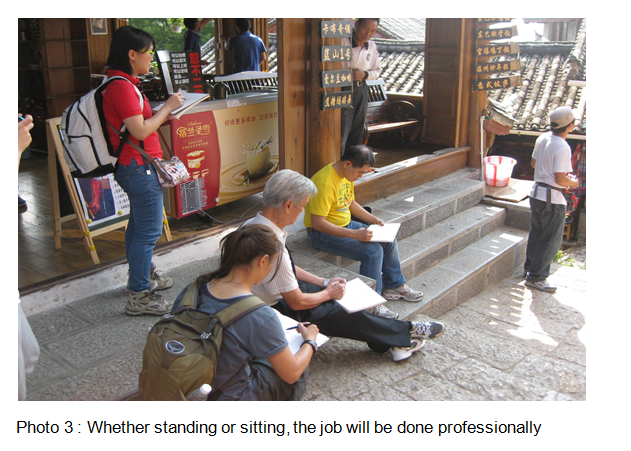 It is to do painting in most beautiful old town of China, Li Jiang Gu Chen. Art teacher Kang Kee has devoted his entire life in doing arts and imparting his knowledge and skills to his students. 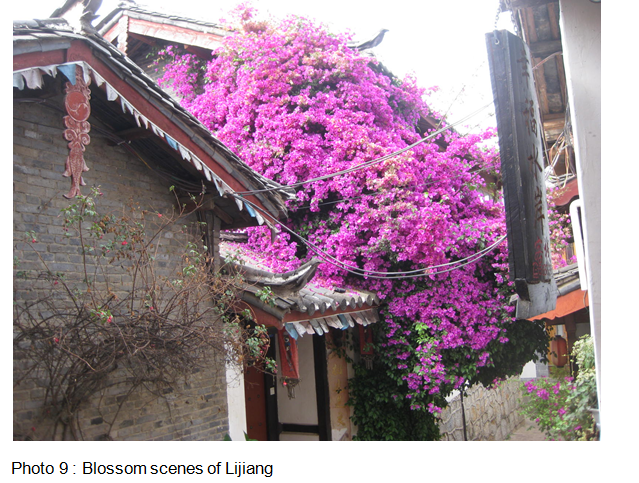 Li Jiang is one location which has inspired him to do his painting and he has done many excellent art pieces of Li Jiang and the surrounding since his last visit in 1996. After 15 years, Kang Kee has decided to revisit this beautiful old town. This round, he wanted to go along with his students. 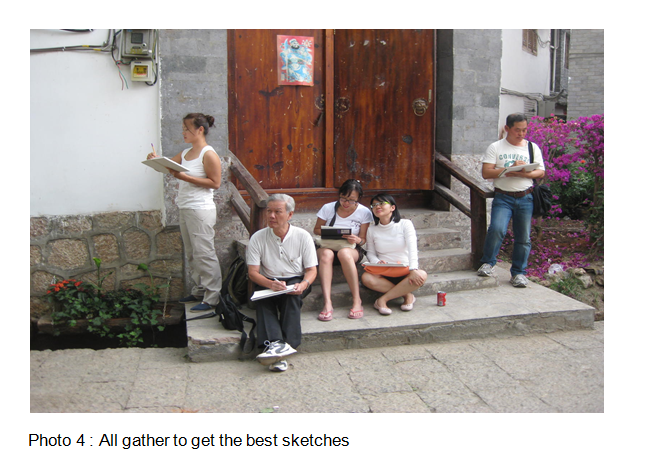 Two art students (Ms Rachel Dong Mei Swee and Ms Oh Ah Ye) went to Lijiang City in year 2008 and year 2010 previously and were very impressed by the scenic view and proposed to visit this old town together with teacher Kang Kee to draw the scenic view, rivers, mountains and soak in this beautiful environment. The planning does take quite a while and after two years, on the 15th of Jun 2013, they are set to go. Both Ms Rachel and Ah Ye propose a one week art enrichment journey suggest that all those art students who are keen to work towards this date. 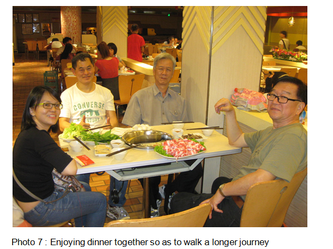 Mr Chong Kim Yuan, Kang Kee son in law, manage to inform his friend, Mr Yee Poh Kin and 2 other art students ( ie. 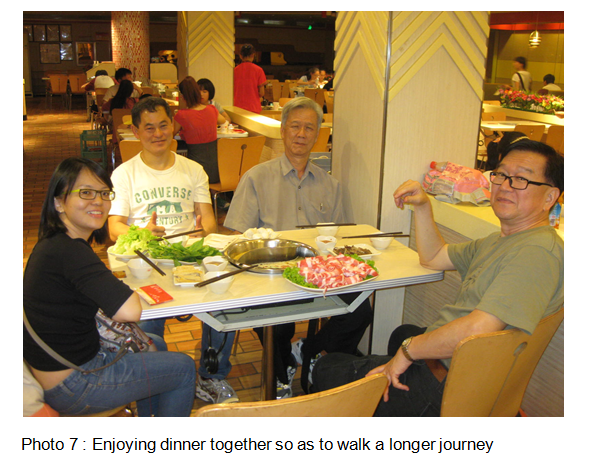 Mr Richard Lim and Ms Tan Yu Qi ) to come along this exciting journey. Thus, there are a total of 7 people in this learning trip and they stayed put in the Dong Ba Inn with the old town itself. It was a journey that I would not forget for a long time. Initially, I was very apprehensive how the trip would unfold. By the way, it was my first trip to China since Mao Zedong’s time. I could feel that I was brought back to the days when the scholars travelled a long distance to take the Emperor’s Examination and had to take intermediate rest in the Inn. The historical and cultural significance suddenly unfolded when I slept in the Inn. I was blessed by the Teacher, brothers and sisters who were there to make the trip memorable. 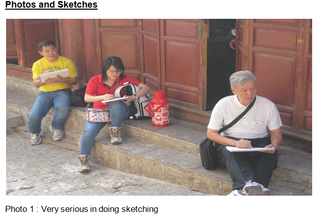 This trip made me realized the need to spend more time to do more drawing and learn the Chinese language and culture. They did quite a few drawings in the Li Jiang old town, Bai Sha old town and also the Su He old town. 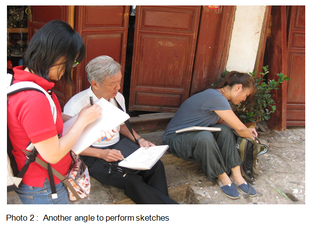 Throughout the trip, Kang Kee is enjoying his drawing and also very patient in guiding his students. 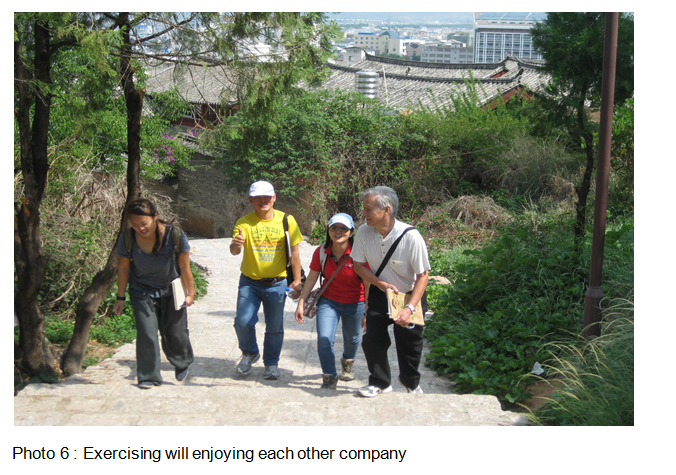 They visited Jade Dragon Snow Mountain as well. Kang Kee at his 70’s, he is still fit and climbing up above 4500m. He did his drawing on the mountain and also drawing at the bottom of the mountain. A total of 50 sketches were completed. The students also did many sketches throughout the whole journey. 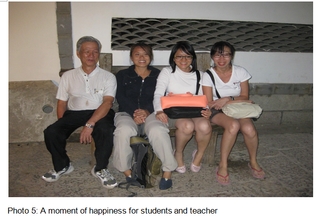 His students were all inspired by his passion towards arts. We wish Kang Kee to come out plenty more inspiring art piece from this Li Jiang trip.